Instructors: Elaine D. Woodhouse, CertEd, CQSW & Clive S. Woodhouse, PhD. Each workshop has several free-choice activities to keep your student engaged. A different main project is offered at each workshop. A variety of materials waiting to be creatively transformed. Lots of opportunity for group play and role playing with a large assortment of building materials, construction toys, and action figures. Lots of Legos! Many to choose from! Including, Mancala, Magic the Gathering, Stratego, Risk, Blokus, Monopoly, Connect 4 etc. Thank you to those parents who were able to make it to the Fall General Membership meeting. It was great to see so many new faces along with our returning members. So, what’s next? We need you to act now. Support the annual campaign: The vast majority of the PTSA budget is provided through our contributions to the campaign. Thanks to you, we are off to a great start at a third of the way toward our 100% participation goal. By continuing toward that goal and giving to the campaign, we will ensure ourselves of having the necessary resources to continue with the tradition of funding into the next school year all the programs we as a Bryant community feel are important. Email Joan Crooks to join the Bryant Advocacy list and receive regular updates on how you can help raise the volume on the need for Seattle Public Schools and Washington State to properly fund education. Join forces with other Seattle Schools in an effort to develop a strategy to put a full stop to the current staff cuts due to take effect this week. For more information about how to get involved visit #kidsnotcuts. State your intent: Jason Smith & a few other parents are spearheading a grassroots effort to gauge the interest doing additional fundraising this year to increase support for the Extension and Intervention program. Thank you again for everyone’s participation and efforts to support Bryant Elementary school. A special thanks for Principle Sanger for taking the time to go deeper in his explanation of Professional Learning Communities and how that teaching model impacts both the staff and our students. It was also helpful to hear how the Intervention and Extension specialist is plugged into the PLC model and how the Intervention and Extension program will need to evolve without a dedicated specialist coordinating the team. Dan Sanger presented how the PLC (Professional Learning Community) works at Bryant and how we can meet our goals with the current funding. Rachel Gleeson shared the details on the #kidsnotcuts http://www.kidsnotcuts.org/-a group that is developing a strategy to put a full stop to the current staff cuts due to take effect this week. We are so fortunate to have such an engaged community at Bryant! The feedback and questions received about the staff proposal to fund the full time Intervention and Extension program specialist demonstrates the depth of that engagement from our families. Over the past several days, the board members have talked to several parents as well as fielded emails asking for additional details around the impact on the budget, unallocated funds and the sustainability of the program moving into the next school year. Parents are openly supportive of a full time dedicated Intervention and Extension specialist, especially in light of the building goals to challenge our advanced learners and see one year’s growth for every student in math, but have reservations about funding it as proposed by the staff. This parental enthusiasm is also shared by the staff and administration at Bryant for the Intervention and Extension team and the Professional Learning Community work being conducted in the building today. Mr. Sanger has shared this work with our community at Curriculum Night and through the Bryant Weekly. However, while the entire staff generally supports the work of the PLCs and the Intervention and Extension program, not everyone is in agreement with the proposal that would deplete building reserves, reallocate budget items and include out-of-pocket money from the staff to fund one of the Intervention and Extension specialists. When the PTSA Board stepped back to consider both parent and staff concerns, it became clear that it is just too soon to force a vote of the general membership. While the District’s pulling of the position came suddenly and decisively, and its immediate repercussions are highly disruptive, acting hastily to reinstate the program at the expense of both building and PTSA funds does not serve Bryant’s families well. To be clear, the Intervention and Extensions program is not going away. It will be scaled back considerably, and this will be challenging to the program, but we still have Teresa Elhardt and Leah Kumar, both half time specialists, as well as our 3 hardworking tutors. District policies impacting the building, resulting in the loss of a teacher. Bryant moving forward around the PLC work with a scaled back Intervention and Extension specialist program this year. Bryant continuing to address educational objectives. Funding the Intervention and Extension specialist, as well as essential professional development for our teachers to implement the changes most effectively and skillfully. What we should be doing as a community to influence state funding for basic education. Thank you to the parents and staff for sharing your enthusiasm and concerns with the Bryant PTSA board and administration. Working together, we’ll continue to strengthen the community that makes Bryant what it is today. Let’s walk together on Friday! Walking bus stations open this Friday, Oct 16! October is Walktober, and we are celebrating the Bryant community’s strong tradition of walking all month long. Please join us this Friday morning, 9-9:15 am, at one of four walking bus stations for a small treat and visit with other Bryant parent and kid walkers. Please contact Michele Solis or Will Mitchell with questions. West Station: 30th Ave. NE/NE 60th St.
South Station: 33rd Ave. NE/NE 55th St.
North Station: 32nd Ave. NE/NE 65th St.
East Station: 36th Ave. NE/NE 60th St.
Live NW or SE of Bryant? 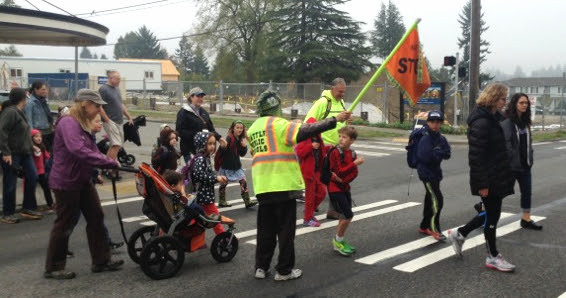 Bryant parents are organizing longer walking buses to school from those neighborhoods. See the scheduled routes and timetables here: NW route and SE route. The PTSA has fielded many questions about the PTSA/staff proposal for continuing the Intervention and Extension program this year. If you have any others, please email the Executive Committee. Q: How much money does the PTSA have in “unallocated” funds and how much will remain after the PTSA allocates funds towards the IE program? A: The PTSA currently has $16,000 in unallocated funds available. That balance will be taken down to $0. The PTSA Board would need to vote on whether to designate those funds to the IE program. Q: What has the unallocated funds been used for in the past and is it wise to have nothing available for the remaining school year? A: Unallocated funds are what is available after the budget has been approved. In the past, the dollars have been used for library purchases, funding the replenishment of classroom emergency supplies, buying educational software for the students. Having no money in unallocated makes it difficult to address new requests that haven’t been budgeted for, making it necessary to tell committees they may have to wait until the next school for funds. Q: What amount is coming from building reserves? Q: How much is coming from the so called “out of pocket” contributions? A: Staff have pledged $14,500 for the 2015/16 school year. Q: What is the plan for raising the remaining $12,000? A: The staff will appeal to the general membership to pledge dollars that will be allocated directly towards supporting Ms James and the Intervention and Extension program. If the initial pledge dollars come in short then the staff will host additional fundraisers throughout the year which might include Parent’s Night Out childcare or a Teacher Experience auction. Q: Given that a bulk of the funding plan is based on one-time or unidentified sources, what is the plan to sustain the program beyond the 2015-2016 school year? A: Funding for the 2016/17 school year is still to be determined. Possible sources of funding could come from the district if enrollment exceeds 600 students and Bryant is granted the full time teacher that was just pulled. Other possible sources could include funds raised during the annual campaign that starts October 12 but would require PTSA budget approval or a separate fundraising event all together where funds would be held in reserve in the event the district didn’t provide the additional full time teacher. Q: How exactly does $80,000 save the Intervention and Extension program? A: The $80,000 is the cost for a full time teacher. The $80,000 would be used to pay Ms. James’ salary and benefits for the 2015/16 school year. By keeping her in the second grade classroom, Mr Matthias would be able to continue to lead the new intervention and Extension program. Q: Where are all the funds are coming from that will be used to fund the Intervention and Extension program? $10,500 – $12,000 from fundraising efforts throughout the year.